← I am a numen and I yearn! Today I’ll tell you about one of our interesting past projects! Maybe you are interested? Russia has summed up the results of a national contest devoted to most beautiful places in the country. Seven Wonders of Russia had been announced on June 12, 2008, during the celebration of Russia’s Day on Moscow’s Red Square. Seven Wonders of Russia include: The Valley of Geysers in the Kamchatka region, Lake Baikal, the complex of palaces in Peterhof, Columns of Erosion in the Komi Republic, Saint Basil’s Cathedral in Moscow, Mamayev Kurgan in Volgograd, Statue of Motherland in Volgograd and Mount Elbrus. The Seven Wonders of Russia contest had been organized in the autumn of 2007 by several media outlets of Russia to attract the public attention to the need of recreating and preserving unique historical, cultural and natural objects in Russia. An official site of this contest – . More than 25 million people took part in the online voting to select the winners. The first stage of the voting ended with the selection of 49 biggest places of interest in the country. Fourteen of them were left on the list after the second stage of the contest. I. The Valley of Geysers is the only geyser field in Eurasia (apart from th e Mutnovsky geyser field) and the second largest concentration of geysers in the world. This 6 km long basin with approximately ninety geysers and many hot springs is situated on the Kamchatka Peninsula in the Russian Far East, predominantly on the left bank of the ever-deepening Geysernaya River, into which geothermal waters flow from a relatively young strato-volcano, Kikhpinych. It is part of the Kronotsky Nature Reserve, which, in turn, is incorporated into the World Heritage Site “Volcanoes of Kamchatka”. The valley is difficult to reach, with helicopters providing the only feasible means of transport. II. 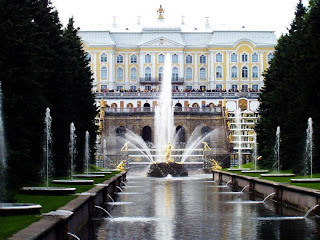 Peterhof, originally nam ed Peterhof, the Dutch for “Peter’s Court,” is a municipal town within Petrodvortsovy District of the federal city of Saint Petersburg on the southern shore of the Gulf of Finland (population 64,791 (2002 census)). It hosts one of two campuses of Saint Petersburg State University. A series of palaces and gardens, laid out on the orders of Peter the Great, and sometimes called the “Russian Versailles”, is also situated there. The palace-ensemble along with the city center is a UNESCO World Heritage Site. III. Lake Baikal is located in Southern Siberia in Russia, near the city of Irk utsk. It is also known as the “Blue Eye of Siberia”. It’s famous for holding a volume of water larger than that of all the North American Great Lakes combined. 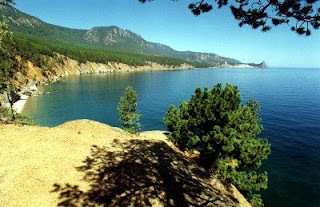 At 1,637 meters (5,371 ft), Lake Baikal is the deepest lake in the world, and the largest freshwater lake in the world by volume, holding approximately twenty percent of the world’s total surface fresh water. Like Lake Tanganyika, Lake Baikal was formed in an ancient rift valley and therefore is long and crescent-shaped with a surface area (31,500 km²) less than half that of Lake Superior or Lake Victoria. Baikal is home to more than 1,700 species of plants and animals, two thirds of which can be found nowhere else in the world and was declared a UNESCO World Heritage Site in 1996. More than 25 million years old, it is the oldest lake in the world. IV. 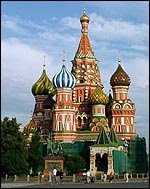 Saint Basil’s Cathedral is a multi-tented church on the Red Square in Moscow that also features distinctive onion domes. The cathedral is traditionally perceived as symbolic of the unique position of Russia between Europe and Asia. The cathedral was commissioned by Ivan IV (also known as Ivan the Terrible) Moscow to commemorate the capture of the Khanate of Kazan. 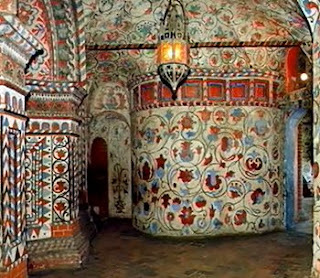 In 1588 Tsar Fedor Ivanovich had a chapel added on the eastern side above the grave of Basil Fool for Christ (yurodivy Vassily Blazhenny), a Russian Orthodox saint after whom the cathedral was popularly named. Saint Basil’s is located at the southeast end of Red Square, just across from the Spasskaya Tower of the Kremlin. Not particularly large, it consists of nine chapels built on a single foundation. The cathedral’s design follows tha t of contemporary tented churches, notably those of Ascension in Kolomenskoye (1530) and of St John the Baptist’s Decapitation in Dyakovo (1547). The interior of the cathedral is a collection of separate chapels, each filled with beautiful icons, medieval painted walls, and varying artwork on the top inside of the domes. The feeling is intimate and varied, in contrast to Western cathedrals which usually consist of a massive nave with one artistic style. V. Columns of Erosion in the Komi Republic. Rock pillars (it is a geological monument on a Man-pupu-ner mountain in Troitsko-Pecherskiy region of the republic of Komi. The height of the pillars varies from 30 to 42 meters. The origin of these pillars is unknown). 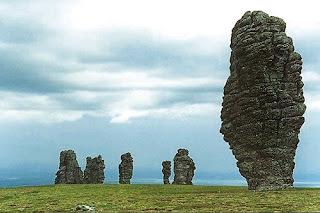 Man-pupu-ner is a mysterious site in the northern Ural mountains, made out of seven rock towers bursting out of the flat plateau, also known as the “7 strong men“. Man-pupu-ner is a very popular attraction in Russia. Their height and abnormal shapes make the top of these rock giants inaccessible even to experienced rock-climbers. Man-pupu-ner is very hard to reach, it lies in a very harsh environment, but once there you’ll be able to enjoy a view unique in the whole world. People who have visited this incredible site, say they have no cravings for water, food or rest, they just want to contemplate the 30-80 meter rock towers, where natives say spirits used to gather in ancient times. VI. Mamayev Kurgan is a dominant height overlooking the city of Volgograd (formerly Stalingrad) in southern Russia. The name in Russian means “tumulus of Mamai”. The Mamayev Kurgan features a memorial complex commemorating the Battle of Stalingrad (August 1942 to February 1943). The battle was a decisive Soviet victory over Axis forces on the Eastern front of World War II and arguably the bloodiest battle in human history. 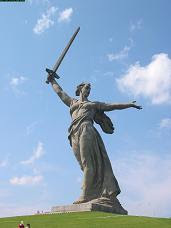 At the time of its installation in 1967 the statue of the Mother Motherland formed the largest free-standing sculpture in the world (82 meters from the feet to the tip of the 27 meter sword). VII. Mount Elbrus i s a mountain located in the western Caucasus mountain range, in Kabardino-Balkaria and Karachay-Cherkessia, Russia, near the border of Georgia, in the northern Iranian plateau. 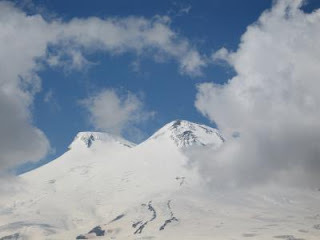 A strato-volcano that has lain dormant for about 2,000 years, it is the highest mountain in the Caucasus. Mt. Elbrus (west summit) stands at 5,642 meters (18,510 ft) and can be considered to be the highest mountain in Europe; it is also the highest point of Russia. The east summit is slightly lower: 5,621 meters (18,442 ft).